If you own a dog, chances are they mean just as much to you as any other member of your family! Dogs provide us so much love and loyalty, it is no wonder we tend to treat them like our own children at times. If you have a pooch you love, why not mark their territory with a DIY Doggy Canvas Print? With just a few simple supplies, you can whip up this simple DIY that will mark your doggy’s food area and show him how special he is. 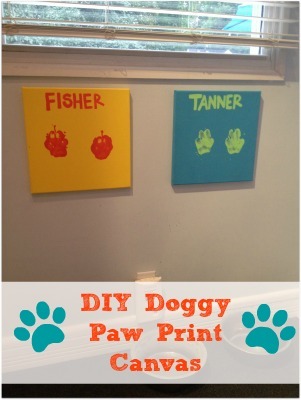 When you imprint your pet’s paws in this easy DIY Doggy Canvas project, you will also have a sweet memory of him that will last a lifetime. Take a look at how easy it is to make your own! Small stretched canvas. You can find these at Hobby Lobby and other craft stores for under $10. If you search around the internet you can often find coupons for as much as 40% off of your purchase to help you save even more! Paint. Children’s finger paint works fine or any tempera paint. 1. Go outside to do this craft or place a large drop cloth down. It may be hard to hold your pet in place when his paws are wet so you want to protect the floor. 2. Apply a coat of paint to your entire canvas. You can choose any color you wish! Allow to dry well. 1-2 hours is sufficient. 3. Call your pup. Ask him to sit or lay. You can give him a treat or a teaspoon of peanut butter to occupy him while you do this portion of the project. Take his paw in your hand and hold it steady. 4. Take your paint brush and apply paint to the paw in a contrasting color from your canvas. Apply to one paw at a time. 5. Press the paw firmly onto your canvas. It is best to do this quickly and just go for it. The slower you go the more difficult it can become. Just go for it! 6. Paint the second paw and repeat. 7. Now, tell your pup how good he is! Take your towels (or baby wipes) and wipe his paws clean. Baby wipes are really great at getting every last bit of paint. 8. Set your canvas prints where they can dry. 9. Once the prints are dry, take your paintbrush again and write your dog’s name at the top of the print. Set aside to dry. 10. Hang with a small nail or even a command hook. That’s it! You now have a sweet canvas print covered with your dog’s precious prints. These canvas prints are fun and frugal to make and make wonderful décor pieces or even gifts. Give this doggy DIY a try and see what you can come up with. You are sure to have fun and end up with a sweet piece you will be so proud of! If you like this DIY Project check out all of our Dog Inspired Crafts. These are so cool. We have Foley’s paw prints and everyday we touch them to remind us of her and it is like we are touching her.